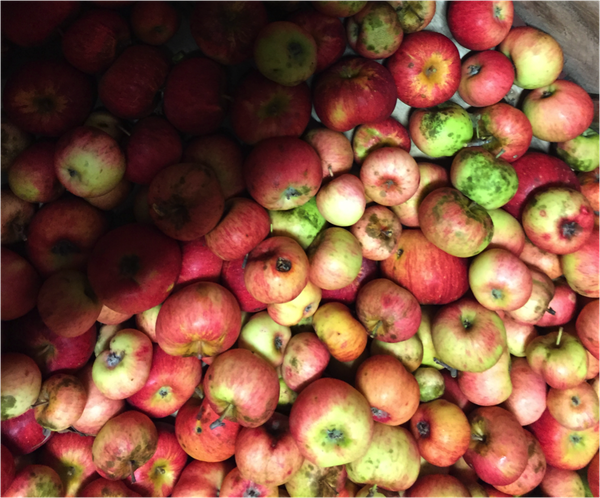 Flyspeck and sooty blotch of apple (FSSB) are cosmetic diseases of apple fruit that can cause downgraded fruit quality or leave fruit unsaleable if infection is severe. 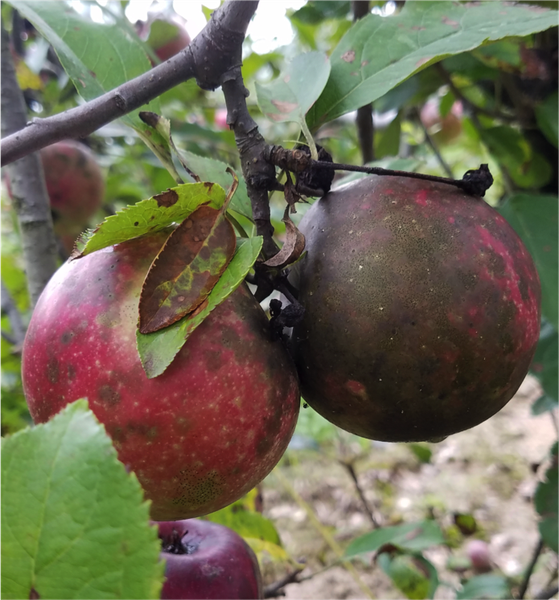 In the absence of fungicide programs, flyspeck and sooty blotch are problematic on apple in humid growing regions throughout the United States, particularly in the Southeast. Flyspeck and sooty blotch are caused by a complex of multiple fungal species. To date it is suspected that more than 60 fungi are associated with FSSB. Signs of sooty blotch appear as dark charcoal-like smudges on the fruit surface. For some infections, close inspection using a hand lens might reveal that these "charcoal-like smudges" are actually hundreds of dark tiny spots clustered closely together. Signs of flyspeck appear as black, pinhead sized spots clustered in circular groups on the fruit surface. Since FSSB is a surface blemish of fruit, removal of affected skin will reveal no symptoms on the apple flesh. 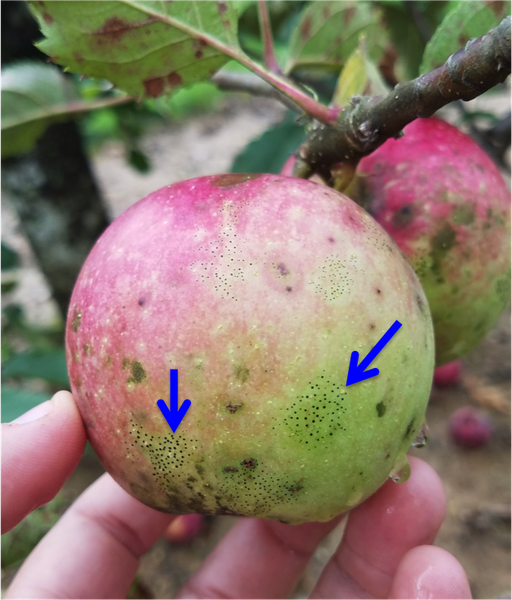 Flyspeck (blue arrows) on 'Gala' fruit. Sooty blotch on 'Rome Beauty' fruit. Harvested 'Empire' apple fruit with signs and symptoms of FSSB. In general, the optimum temperatures for infection and growth of the causal agents of both flyspeck and sooty blotch of apple are around 61-84°F. Conditions of high relative humidity (>/=97%) favor conidial germination of fungi causing FSSB. In North Carolina, symptoms of FSSB begin to appear after an accumulated 273 hours of leaf wetting after first cover (~10 days after petal fall). Only wetting periods 4 hours or greater are considered for the incubation period. In well-managed orchards, reservoir hosts growing in wooded areas that border orchards are believed to be the primary sources for FSSB epidemics. Wild blackberries have been determined to be an overwintering source of Schizothyrium pomi, the primary causal agent of flyspeck in the Northeast. For orchards with a history of FSSB, inoculum may also be present from within the orchard. Fruit mummies and apple twigs/branches, have been identified as overwintering sources of FSSB fungi. Management of FSSB involves a combination of cultural control measures and well-timed fungicide applications. Disease forecasting models based on accumulated leaf wetness hours, rainfall, host phenology, and previous fungicide applications are available to assist in decisions regarding preventative fungicide application timings for FSSB control. In North Carolina, fungicide applications targeting FSSB should be initiated around first cover (approximately 10 days after petal fall). If a disease forecasting model is not being used to predict FSSB infection events, applications should continue on a 10 to 14 day calendar schedule until harvest. In fungicide efficacy trials conducted in 2016 and 2017 at the NC State Mountain Horticulture Crops Research and Extension Center in Mills River, NC, single-site fungicides from FRAC groups 3, 7, and 11 (S.I.s, SDHIs, and QoIs, respectively) all demonstrated high levels of control against FSSB and in many cases reduced disease incidence between 0 and 5%. If captan is being applied for summer covers, an EBDC (M3), phosphorous acid fungicide (e.g. ProPhyt) or a single-site fungicide should be applied in tank mixture with captan to provide adequate control of flyspeck. The table below lists active ingredients / products that have demonstrated high levels of efficacy in field trials at NC State for FSSB management. A more comprehensive list of registered fungicides for FSSB management may be found in Integrated Orchard Management Guide for Commercial Apples in the Southeast. Please note that fungicide labels are legal documents-always read and follow label directions. Table 1. Example commercial fungicides for flyspeck and sooty blotch.